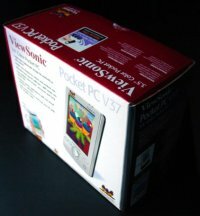 The Viewsonic V37 arrived packaged in a nice, solid box. It bore the Viewsonic logo, along with their standard trademark which consists of three vibrant birds perched in a line. The Microsoft Windows Powered logo is also shown on the front of the box. The perfect solution for a mobile world. for the Pocket PC V37. to wirelessly distribute applications and update images remotely. purse, backpack, or hand � wherever you need it most. >Bring files from your PC with you � MP3 music, too. type a memo, work on your budget or relax with your favorite MP3 music. V37 can keep up with you and all you do � think, live, play.